Hiking Daytona Beach | Florida Hikes! Outdoor recreation around Daytona Beach showcases both oceanfront natural lands and wilderness areas along the estuaries and pine woods to the west of the coast. 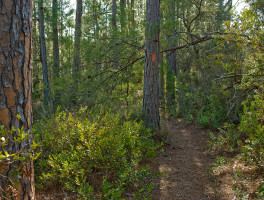 Established in 1908 as the first National Forest east of the Mississippi, the Ocala National Forest is a mecca for hikers as the birthplace of the Florida Trail. In the 1940s, Ormond Memorial Art Museum members hired noted landscape architect Henry Stockman to design the Ormond Memorial Gardens on relict sand dunes, landscaping to accent the art museum on site. It was dedicated as a memorial to the fallen soldiers of World War II. Traverse the Intracoastal Waterway on a paddleboarding adventure for a cause: broken into a series of day paddles, Something I Will Never Forget, an organized paddleboard journey, spans from St. Augustine to Palm Beach. 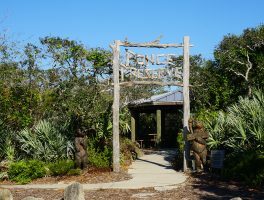 Just south of Daytona Beach, Ponce Preserve protects a cross-section of barrier island habitats, with more than 2 miles of trails connecting the beach and the Halifax River. Yep, that’s a stegosaurus hiding in the bushes. Sugar Mill Botanical Gardens has had a lot of faces over the ages, including a stint in the 1950s as Bongoland, a roadside attraction full of not-so-scary dinosaurs. 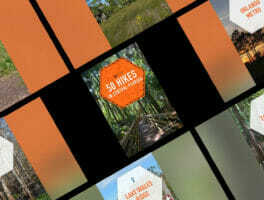 We launched a new full-color edition of 50 Hikes in Central Florida at the National Trails Festival in Deland the first weekend of October. 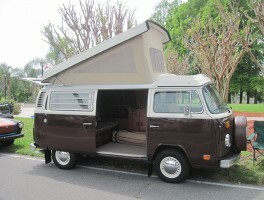 Take a peek inside. 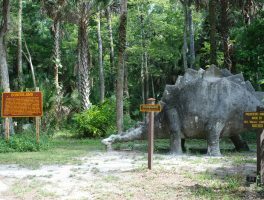 Walk in the footsteps of the Timucua beneath the ancient oaks at Tomoka State Park. 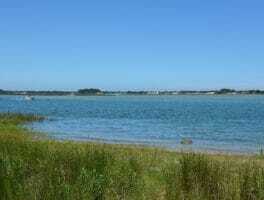 The peninsula was the site of the village of Nocoroco, a thriving community on the shores of the bountiful river.